CJI student Kate Marie speaks to the co-founder of Freeway Music, Tony Lee. Tony is giving an interview, and is explaining his favorite part of Freeway. He says, “it’s all of this, getting kids gigs, interacting with the community,” a testament to his focus on community with Freeway. The second band of the night, playing the stylings of Green Day and Evanescence. The lead vocalist had red hair, which looked stunning when combined with the soft red spotlight from the top of the stage. “Oh yes, come on, listen to these guys they’re great,” said Tony Lee after our short interview. A lead vocalist taking a break from singing and winding down by dancing during a long guitar solo. She was the most animated dancer of the night, truly showing how much fun she and those around her were having by performing. A vocalist and bass player hits a high note in the song Cake by the Ocean. Her band’s performance was especially unique, combing the stylings of Bruno Mars, Justin Timberlake, and Earth Wind & Fire. “I loved her, she was so into that,” said CJI student Grace Butler about the band. Band “Ramblin’ Road” gives the camera some love during their last song of the set. The lead singer’s voice was possibly the best of the night, filling the entire room with his incredible sound. “So we have this one kid, who’s performing tonight, and when he came to us (FM) he had terrible stage fright, and just listen to him, his voice is incredible,” says Lee. The guitarist for Ramblin’ Road had several incredible solos, as well as each other member of the band. Each member of the band showed their expertise at the Tin Roof, proving the skills of the FM instructors. “Oh wow, that boy can play the guitar,” said a voice from the bar. The bassist for Ramblin’ Road accented every note with experienced perfection, providing Ramblin’ Road with a part of their unique sound. Yeah, i’m pretty sure he’s been playing some kind of instrument since he was born,” said the band’s vocalist, Red. The lead vocalist for Sharkbait hits an incredible note in the song Gospel by “PANIC! at the Disco” The note was one of several that the vocalist showed off on. “It could’ve been better,” was her response when told that she did fantastic by one of our reporters. Co- Founder Tony Lee films the final band in the Rock Band showcase. This band got the crowd involved, playing Uptown Funk by Bruno Mars getting a very positive response. At times the crowd joined in, singing the most memorable lines from the Bruno Mars song. The band set a fast-paced, pop mood for the last song of the evening. Grace Butler, Eli Clarke and Kate Marie Mattmiller cover Freeway Music and attend one of its student showcases. AJ Carr, Joshua Ford, Melvin Harris and Kendall Smith cover and attend a game of summer collegiate baseball team Lexington County Blowfish. Alana Deany, Grace Farrar, Elizabeth Hoefer and Ananda Kobierowski share their experiences at two Columbia bakeries. Kelly Fulford, Mari Pressley, Shailin Tisdale and Katie Grace Upchurch cover the artistic projects and initiatives of OneColumbia, a non-profit organization formed to advise, amplify and advocate for the unified arts and history community in Columbia, S.C.
Aneesa, Danielle and Elena prepare for an interview at LSC refugee resettlement center. Aneesa Conine-Nakano, Elena Gilbertson Hall, Jaydn James and Danielle Young visit Lutheran Services Carolinas and cover their refugee resettlement services. Will Davidson, Malaysha Mitchell, Aaliyah Outler and Kinsley Thurston visit the recently renovated Richland Public Library to discover all it has to offer the community. Woodworking, studios & film space…oh, my! 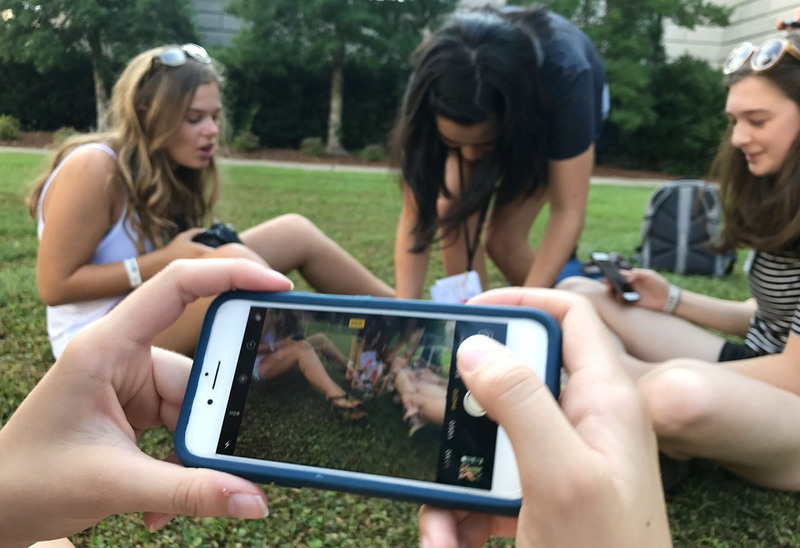 Lori Davis, Molly Disharoon, Amelia Morton and Sydney Tisdale discover all there is to do during the Total Eclipse Weekend 2017 in Columbia, South Carolina, and inform you about the total solar eclipse.